I'm trying to learn and test React.PureComponent and it keeps rendering even though no state changes for that pure component. In the above code, you can see that, there is no state in the component. It only accepts the action function as props from connect. However, whenever I clicks on the Reset Data button, it keeps calling the render method as shown in the screenshot. In the screenshot, I can see that, global state store has been changed whenever, I click a button. But, that state is not used in my PureComponent and it should be out of the scope and my component should ignore to re-render. 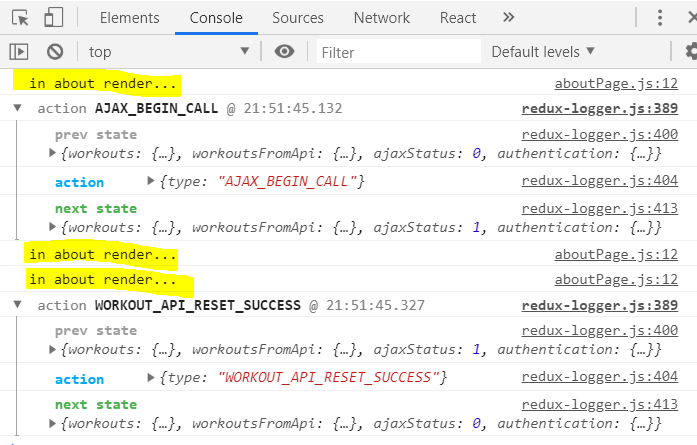 Or Redux Action functions are created every time the global state store has been changed. And passed as a new object to my PureComponent ? Theoretically, I don't need to write my own shouldComponentUpdate function, right? I'm confused and could you please help me to understand about this behaviour? My goal is I don't want my PureComponent to render again when a user clicks a button. Not the answer you're looking for? Browse other questions tagged reactjs react-redux react-component or ask your own question. How to dispatch Redux action from stateless component when route is loaded? How do I avoid re-rendering a connected React PureComponent due to mapDispatchToProps functions?